As you can see, there are two tabs, one to view the Network, and one specifically for Cameras. 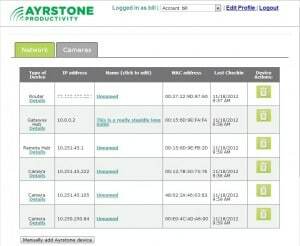 In the Network Tab, the first thing on the page is the device table. 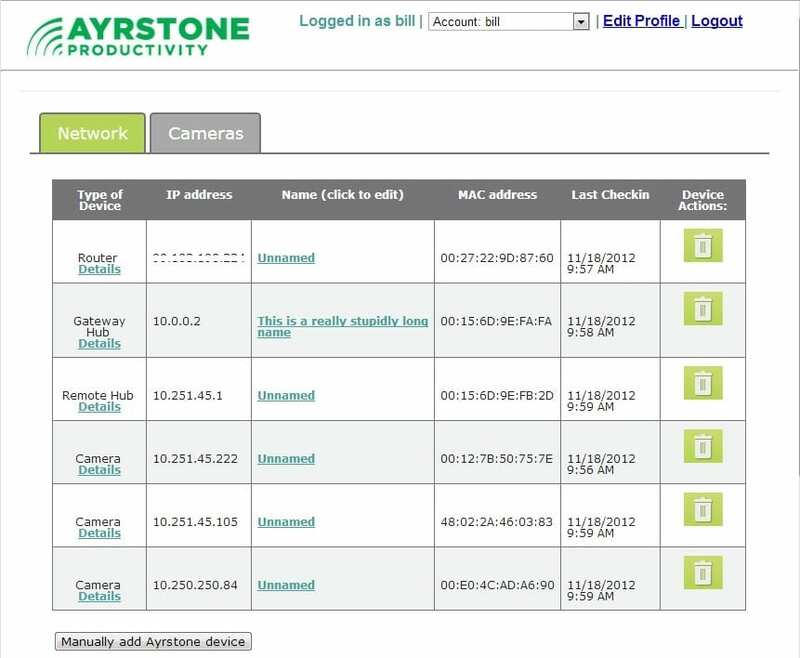 In this table, you'll see all your Ayrstone devices - Routers, Hubs, and Cameras - in one place, along with their IP addresses, names, MAC addresses, and last checkin times. If a device is late checking in or has never checked in, the checkin time will be in RED in that column. Names are much more easily given and changed to devices - just click on the name to edit it. Names are limited to 35 characters. 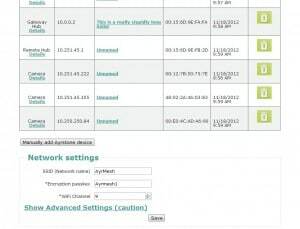 For all devices, the type of device, MAC Address, and name are shown at the top of the page. For Routers and Hubs, next is a table showing all the attached devices to which the Router or the Hub are providing a DHCP address (i.e. 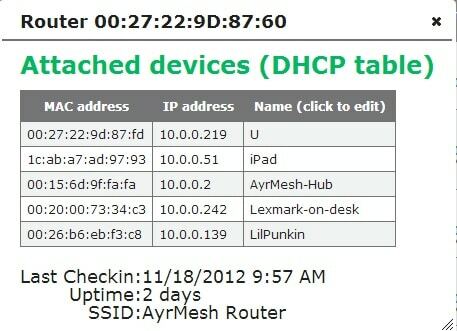 the DHCP table). 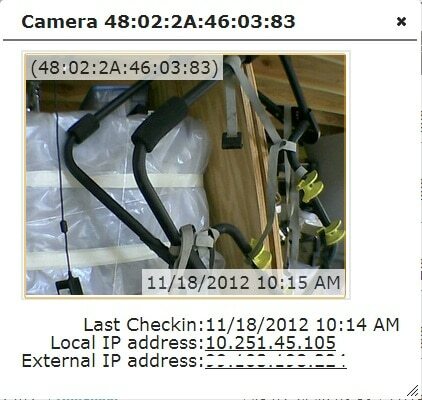 Note that devices using a Static IP address are not shown here. Below that, for the Routers and Hubs is the time of the last checkin, the uptime (how long the device has been operating continuously) and the SSID for the WiFi Access Point are shown. This window gives you a brief but very complete view of your devices. For a Remote Hub, there is one additional piece of information: the bandwidth to the Gateway Hub. This is shown in Kilobytes per Second (KB/s); to translate to Kilobits per second (Kbps), multiply by 8. For the first "circle" of Remote Hubs (those "talking" directly to the gateway), this figure should be around 1000 KB/s (8000 Kbps or 8 Million bits per second, a.k.a. Mbps). As you can see, my Remote Hub is only getting about half the expected speed to the Gateway (because of some pretty severe obstructions to line-of-sight here in the lab). You can also see that it just rebooted itself a little over 3 hours ago, which may be a sign of trouble. You'll see the date and time the picture was taken, and then, underneath, the last checkin date and time. Underneath that, you'll see the links for the Local IP address (to use when you're on your own AyrMesh network) and the External IP address (blocked from view here) for use when you're away. 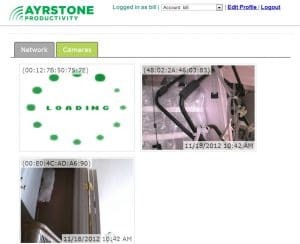 Clicking on these will take you directly to your camera, or you can copy them to paste them into a browser or your Camera Monitoring software. Still on the Network tab, if we scroll down, we come to the new Network settings area. This works just like the Network Management screen on the old AyrMesh.com - you can change the SSID, Encryption Passky, or channel of your AyrMesh Hubs here. Just fill in the values and click "Save" to save them. There is also a an Advanced Settings area (as before) for use if you are using your AyrMesh Network for "public" use (not for use just on your property or business). We do not advise the use of these settings unless you are providing WiFi primarily for "guest" use. As before, you can enable Client Isolation (so people on the network can't access anything on your local network) and turn off encryption (for open access). Neither of these can be used the the AyrMesh Router or AyrScout Cameras, of course. Finally, I just wanted to show you one other feature several people have asked for: the ability to see several AyrMesh networks from a single login. Note that, at the top of the screen, it says, "Logged in as bill" and then there's a dropdown that says, "Account: bill"
By filling in an email address that is known to AyrMesh.com (i.e. 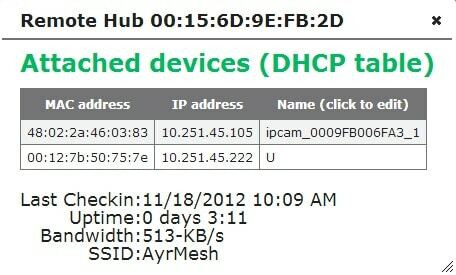 the email address of another registered AyrMesh.com user), I can give that person permission to manage my network. This comes in very handy, for instance, if you have two AyrMesh Networks, one at home and one at your workplace. Up until now, you have had to log out of your home account to log into your work account. However, in the new portal, you can just give permission back and forth, then manage either account from either login. We think these changes will be extremely valuable in making your AyrMesh network even better and easier to use. Of course, we welcome your comments and questions at info@ayrstone.com.